Can a novel focussing on the lives of three women span three complex, earth-shattering decades without being reductive? 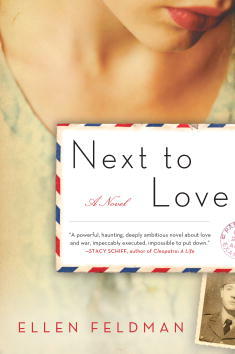 This is what U.S. author Ellen Feldman (shortlisted for the Orange prize for her 2009 novel Scottsboro) seeks to do in her new novel Next to Love. The story follows three friends living in a small town in Massachusetts between 1941 and 1964. Babe, Grace and Millie are each left behind as their men go off to fight in WWII. Those who return are maimed terribly, and not just in the physical sense. Babe’s shell-shocked husband Claude has seen so much that his missing fingers are genuinely insignificant to him. Babe is dropped from her job in a telegraph office as soon as the soldiers return, and spends the novel railing against discrimination, not just against women but black people too. Grace and Millie seem unaware of any discrimination, or if they’re aware of it they don’t let it bother them. Grace has no problem being a housewife, except that she’s missing a husband and can’t seem to function without him. The quickly re-married Millie appears to have dealt with the grief of losing her husband astonishingly well, but appearances can be deceptive. Throughout the narrative, we learn many things: that Jewish soldiers were told by the U.S. Army to ‘Eat ham for Uncle Sam’, their necks looped with dog-tags stamped ‘H’ for Hebrew; that black soldiers lived by the myth that their time on the battlefield would earn them equality back home; that countless working women were sent home (just like Grace is) to be cinched-in by full skirts and tight bodices, condemned to the kitchen to cook elaborate meals for men with the trembles. Despite the new material wealth (when industries, swollen by producing military equipment, poured their resources into peacetime needs) the women’s hearts and men’s minds were still breaking. Broken hearts and shell-shocked minds are bad enough, but it’s how their trauma is dealt with that causes the greatest damage to these characters. The three women’s husbands may have been ‘startlingly articulate’ in their letters home, but sharing is seen as unmanly and the unspeakable remains unspoken. Women like Millie seem to deal with their grief by painting lipstick smiles on their faces and taping things up in boxes. That’s what the men had been fighting for, after all: the image of the ‘good Christian wife’. When the men return, having seen ‘dead bodies with twisted limbs, staring eyes, and oozing intestines’, how can they find such beauty and such innocence so unsettling? It isn’t just the men. The three women in the novel turn to drink, develop obsessions and crumble like their meticulously-crafted pastries. Overwhelming, suppressed grief is to blame, but so is the chilling ‘Housewife’s Syndrome’, cured, according to Babe’s doctor, by gardening, needlepoint and painting by numbers. The doctor is keen to try the last himself but doesn’t have the time. Feldman manages to cover all these wide and weighty problems whilst remaining deeply personal and engaging, her prose never forced or preaching. In fiction it’s often better to go narrow and deep rather than wide and shallow, but Feldman manages to go both wide and deep. By selecting each excellently drawn character, she is able to demonstrate a particular concern through their thoughts, actions and the things that happen to them, whether it’s Babe and her opinions on equality, Grace and her obsession with a ghost, or Millie and the anti-Semitism her family endures. So can a novel focussing on the lives of three women span as many decades without being reductive? The answer to that is yes, so long as you’re in the hands of a writer as skilled as Feldman.